The inventors of the ideal cut present this matching engagement ring and wedding set, with every diamond in the set made with the precise ideal-cut formula allowing for superior fire and brilliance for a truly dazzling finish. The engagement ring also features a cushion-shaped halo of round brilliant diamonds and diamond-set shoulders that match off perfectly with the included wedding ring, for a beautifully stacked look on the finger. 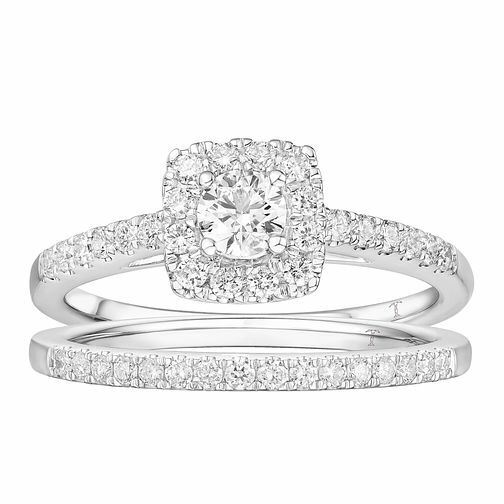 The total weight of the diamonds from both rings comes to a total of 3/4ct.